Queen Victoria has her eye out for old Blackbeard. No BS! We’re under pirate alert! Captain Connery issued the warning after we departed Sri Lanka. Right now, we’re two degrees north of the equator, 68 degrees east of the Prime Meridian, heading southwest toward the Seychelles. Seas are calm, so Her Majesty’s zipping along at 21 knots. Flying fish are everywhere, and the sun’s beaming. Ninety degrees Fahrenheit, poolside! There isn’t a cloud in the sky. If we’re not captured or sunk, we’ll arrive in Port Victoria in a couple days. For a few nights, though, as we transit this sector of the Indian Ocean, the outside promenade on Deck 3 will be shut down, and Queen Victoria’s external lighting will be reduced to running lights and several deck lights. Guests in staterooms with balconies have been told to keep balcony lights off. And, curtains closed. It wasn’t much of a drill. Guests only had to return to their staterooms. Those in rooms with balconies and portholes sat in their hallway away from cabin doors. Guests with inside cabins enjoyed the luxury of being in their rooms. A loud speaker summoned firefighters and security personnel to the outside promenade. Perhaps they were handed broomsticks and kitchen knives. I don’t know. Queen Victoria doesn’t carry firearms — so I’m told. In Aberdeen, Hong Kong, people still live on their boats. Passengers were jittery. Bits of bluster. False bravado. Empty threats. All the stuff that disguises fear floated down our hallway. Truth be told, no one knows how they’ll react. Karen asked if I was scared. Mates, I was a basket case on that outing. Stubby the crocodile is tempted with a piece of meat. Queen Victoria was berthed in Darwin, the capital of Australia’s Northern Territory, when dear wifey got an itch to do something wild. Another city highlight tour wasn’t going to cut it for her. So, we ended up on the Adelaide River, 40 miles outside Darwin. 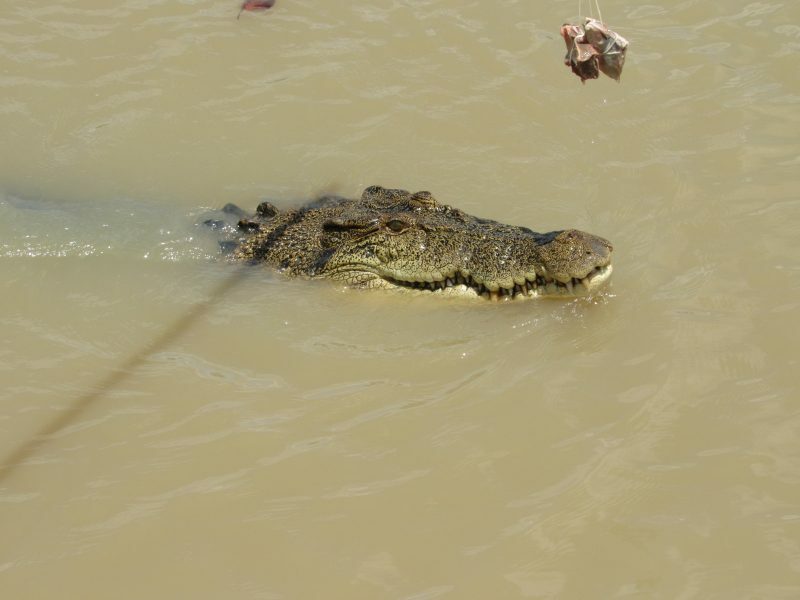 Now mind you, the Adelaide is one of eight croc-infested rivers flowing through Australia’s Top End. Over 1,600 crocs swim in its waters. And yours truly suffers croc phobia. No lie! Remember Peter Pan? Well, the croc chasing Captain Hook scared the bejesus out of me. I was only five. Of course, Karen wasn’t aware of this. But then again, why would she? Twenty years of marriage, we’ve never seen Peter Pan together. Or, encountered crocs — until now. Anyhow, I was a Nervous Nellie. Whole ride out on the bus I kept mumbling: “Crocodile rocking is something shocking.” You recall that lyric, don’t you? It’s from Elton John’s hit single — Crocodile Rock. Karen thought I was trying to be funny. I wasn’t. I was reciting the line to keep from going bonkers. You know — a mantra. Swim like hell for shore? My heart bounced into overdrive. My best stroke is the doggie paddle. Then, five minutes later, a croc arrived for a meet and greet. I nearly brought up breakfast! This creature could’ve swallowed me whole. It was one of those Crocodile Dundee monsters. We were about a quarter mile down river. “Wonder how big the other beast was,” I whispered to Karen. I was turning into jelly. The croc lunges out of the water for his meal. 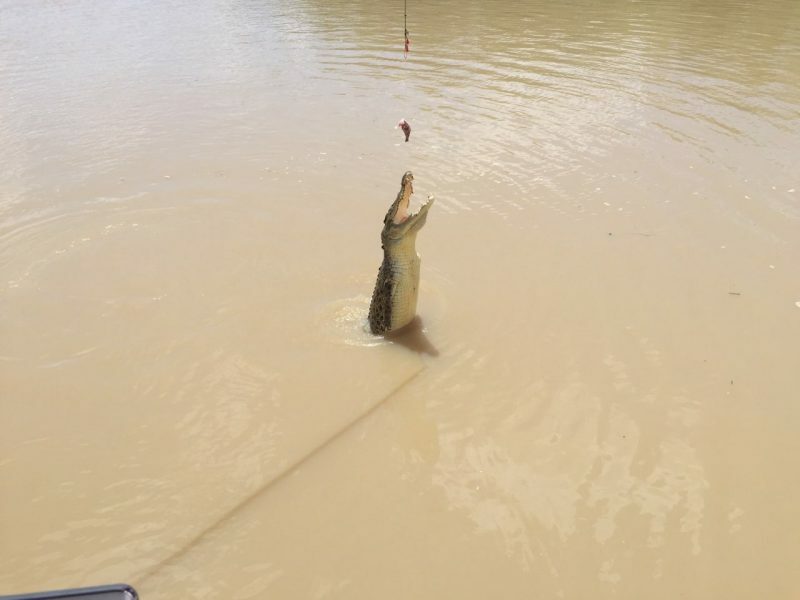 Just so you know, two types of crocs make Australia their home: saltwater and freshwater. Salties feature broad snouts; they can grow to six meters—that’s 21 feet. Freshies, on the other hand, their snouts are tapered and they can grow to four meters or 14 feet. Both can live in salt and fresh water. Talk about being a Nervous Nellie. I could barely watch as Captain Nigel’s assistant, a young Sheila named Donna, extended a pole and dangled a handful of chicken before Stubby’s eyes. At first, Mr. Stubby wasn’t too interested. Perhaps he was crotchety. Captain Nigel said a salty can live 70 years, and Stubby was pushing sixty. Anyway, he just swam by. But after a lap around our pontoon boat, the old boy couldn’t resist the swaying bait. First his snout, then his head, then half his body rose from the muddy river — an easy feat since a croc’s tail is pure muscle. Opening his mouth, he revealed a jagged set of pearly whites. Then swoosh. He disappeared. So did the chicken. Everyone applauded. Except me. I was trembling inside and out. Karen though didn’t notice. She was too caught up in the spectacle. It wasn’t until maybe forty minutes later that she overheard me mumbling “Crocodile rocking is something shocking.” I was on the edge of the seat, my hands clenched, head bowed, staring at my feet. It wasn’t until we were on the bus, halfway back to Darwin, that I confessed my secret. But still, that didn’t get me any sympathy. Karen still thought I was loony. But hey, crocodiles scare me! Always have; always will. 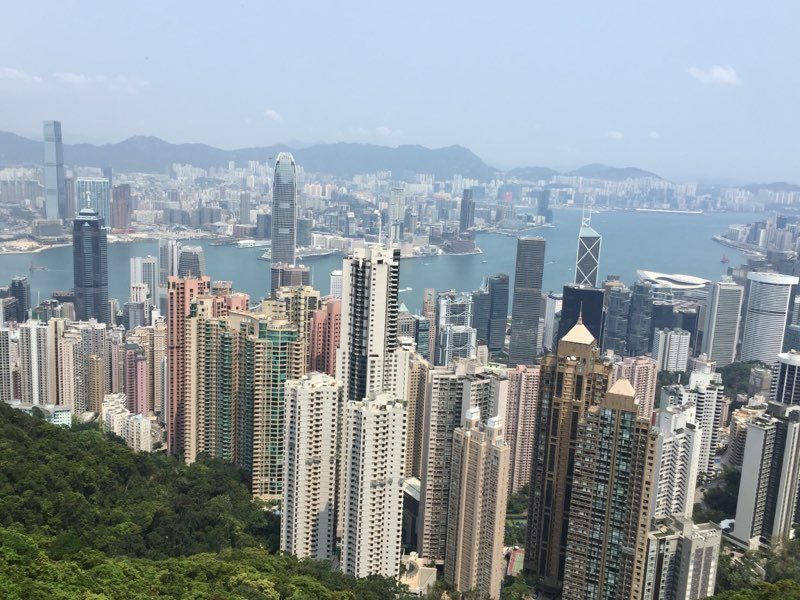 Panoramic views of Hong Kong’s soaring skyline unfold from Victoria Peak. Anyhow, sitting outside our cabin, Karen began imagining “What if” scenarios. What if we’re captured? What if they torture us? What if they kill you? I mean, she was terrifying me! Well, it was either my false bravado or John Steinbeck’s line from Travels with Charley that made an impression. Because Karen sighed, then smiled, and once again all was well. Anyhow, pirates or no pirates, mates, this trip’s been a whirlwind. And before I sign off, let me bring you up-to-date. After New Zealand—that’s where I last left off — Queen Victoria sailed for Sydney, Australia. Yes, we arrived safely. Of course, we toured Sydney’s opera house, who wouldn’t? It’s famous. We also boozed it up in the Fortune of War, Sydney’s oldest pub. A chalkboard sign reading, I can’t walk on water, but I can stagger on beer lured us in. We even made it over to Manly Beach, a surfers’ haven, where we hung out with Mark and Julie Preece, owners of Manly Longboard Company. They were gearing up for the VISSLA Surf Pro championships. 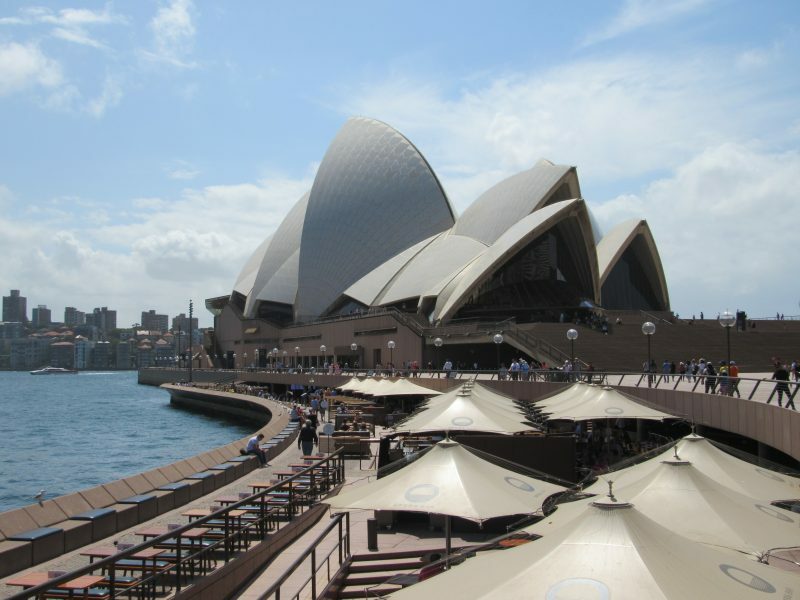 A stop in Sydney, Australia, includes a tour of the famous Opera House. 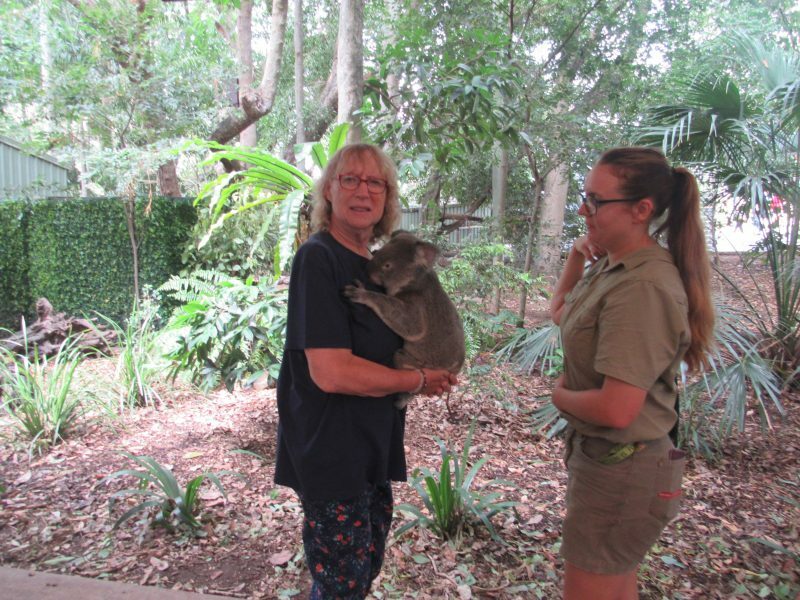 In Brisbane, the capital of Queensland, dear Karen realized a life-long dream—she held a koala bear. A soft gray-haired tyke with big round eyes named Connor. A day later in the Whitsunday Islands, a Maori Wrasse stared me down while I realized my dream of scuba diving the Great Barrier Reef. Over on exotic Bali, we paid our tribute to the Hindu god, Vishnu. A giant 80-foot statue of the god, riding atop a mythological bird, called Garuda, can be seen for miles across the countryside. In the southernmost part of the island, we visited one of the most sacred temples of the Balinese people—the Uluwatu Cliff Temple. Believe me, the heat and humidity almost did us in climbing up the hundred plus steps. Then in Nam, we had the Mekong River experience. Did you know the Mekong originates in Tibet and flows through five countries before reaching Vietnam? I didn’t. A motorboat ran us out of My Tho to the island of Thoi Son. 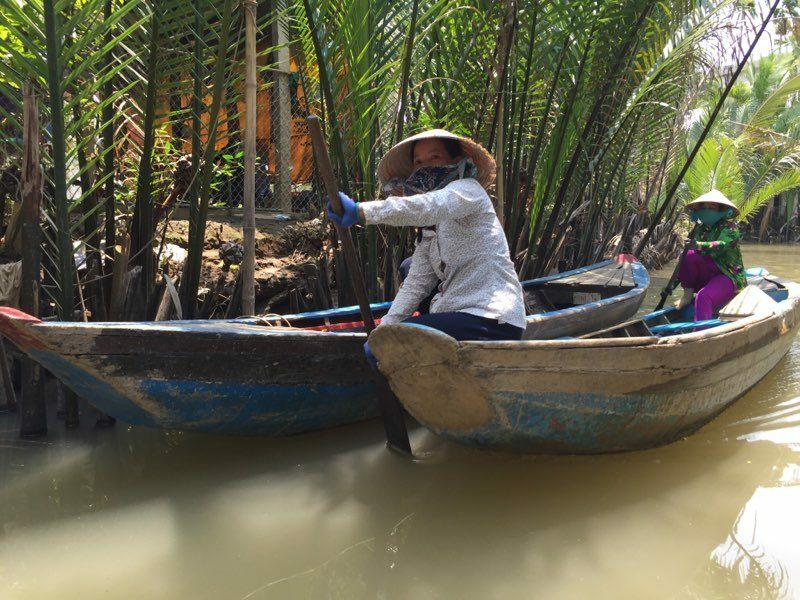 There we transferred to tiny sampans and paddled through a maze of narrow waterways. Afterwards we dined on Elephant Ear fish. Yes, we did get to Da Nang and Non Nuoc Beach. We rode across Dragon Bridge and even had pedicabs whisk us through the crowded downtown streets. Queen Victoria even stopped in Nha Trang, one of Vietnam’s most popular resorts — the food there was awesome! 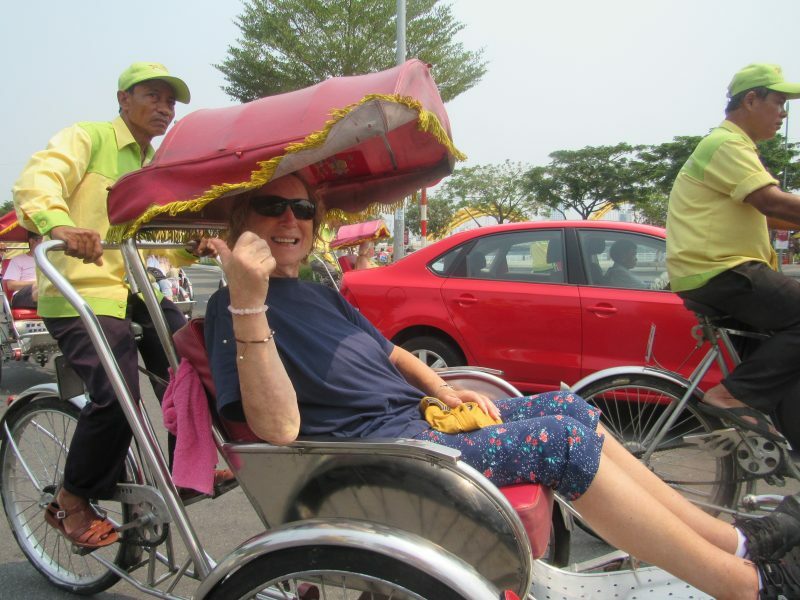 Karen Bender, the author’s wife, takes a ride in a pedicab in Vietnam. As you’d probably guess, Hong Kong’s magical. But the world of Suzy Wong is gone. Skyscrapers are the new norm. 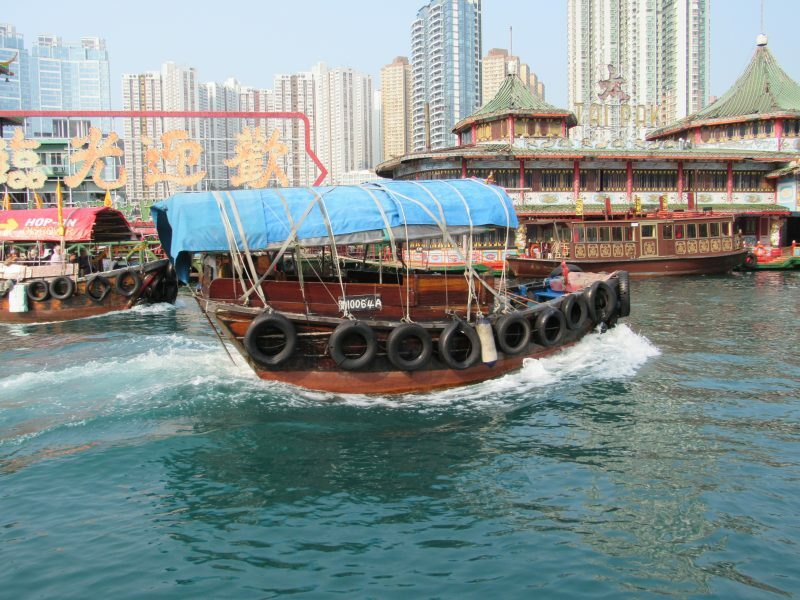 We rode Hong Kong’s Star Ferry around Victoria Harbor; shopped in Stanley Market, and had a sampan ride over in Aberdeen. A guided tour helped us reach Victoria Peak. And, of course, we witnessed Hong Kong’s Symphony of Lights. We couldn’t miss that. Every evening from 8 to 8:10, a kaleidoscope of colors decorates the sky. Singapore didn’t disappoint either. A trishaw sped us by Bugis Street Market, then through Little India, before we ended up at the famous Long Bar at the Raffles Hotel. Sometimes called the Writers Bar— Somerset Maughan and other scribes drank here — this is where the first Singapore Sling was served. Bartender Ngiam Tong Boom — you gotta love that name — gets all the honors. He came up with the concoction in 1915. Believe me, sitting there, drinking Tiger beer, and Singapore Slings, while listening to Dean Martin sing “Everybody Loves Somebody Sometime,” made an afternoon we’ll never forget. And Port Kelang, on Malaysia’s west coast, we’ll always remember this place, too. That’s for sure. On nearby Carey Island, we rubbed shoulders with descendants of the Mah Meri people; their ancestors date back over 3,000 years. I even took part in a mock wedding ceremony staged inside the Mah Meri Cultural Village. No kidding. I was father of the groom. Not an enviable position, when it’s discovered your son isn’t a virgin. Ha! I had to pay daughter-in-law’s parents 21 water buffalo! 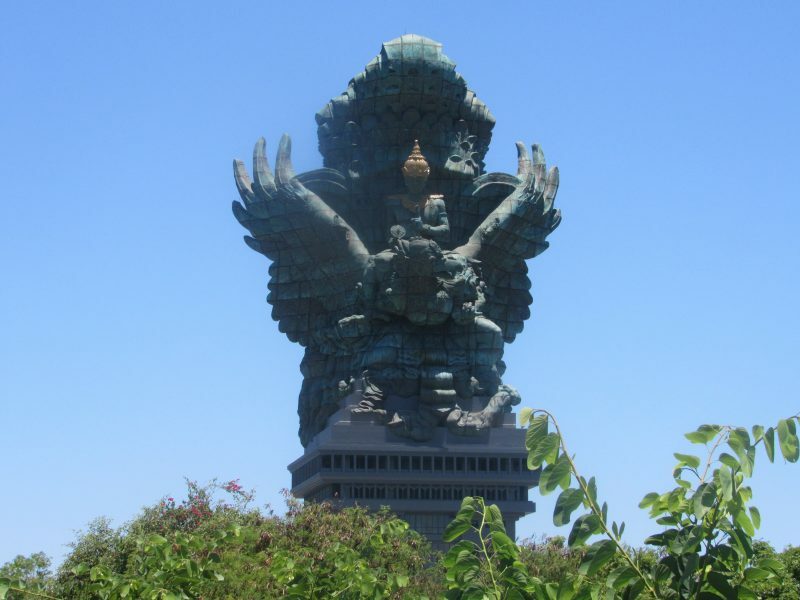 A statue in Bali depicts the Hindu god Vishnu riding a mythological bird. Three days after that experience, we called on Sri Lanka; you know, that pear-shaped island off the southern tip of India. For about three hours, Karen and I toured Colombo, the capital city, by bus. 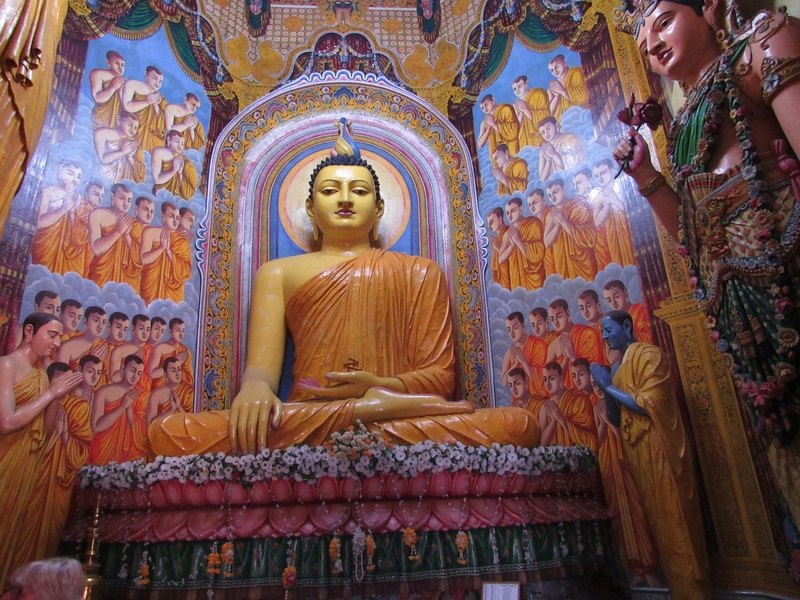 We stuck our heads in Buddhist temples, Hindu temples, you name it. What’s fascinating, all the street names are in three different languages — Sinhalese, Tamil, and English. Which I guess isn’t too surprising — Colombo’s situated at the crossroads of the ancient spice routes. Well, as I said to you earlier, we’re bound for the Seychelles. It’s not really a long run — about 830 nautical miles. But it is dangerous. Our captain has made that clear. So, please cross your fingers for us. Karen and I don’t want “pirate activity” stopping Queen Victoria from sailing her last leg. Or, for that matter, stopping me from writing my final letter! Mates, I’ll be in touch soon — if all goes well. Karen Bender holds a koala bear named Connor at a sanctuary in Brisbane, Australia. Sampans ply the back waterways off the Mekong River in Vietnam. 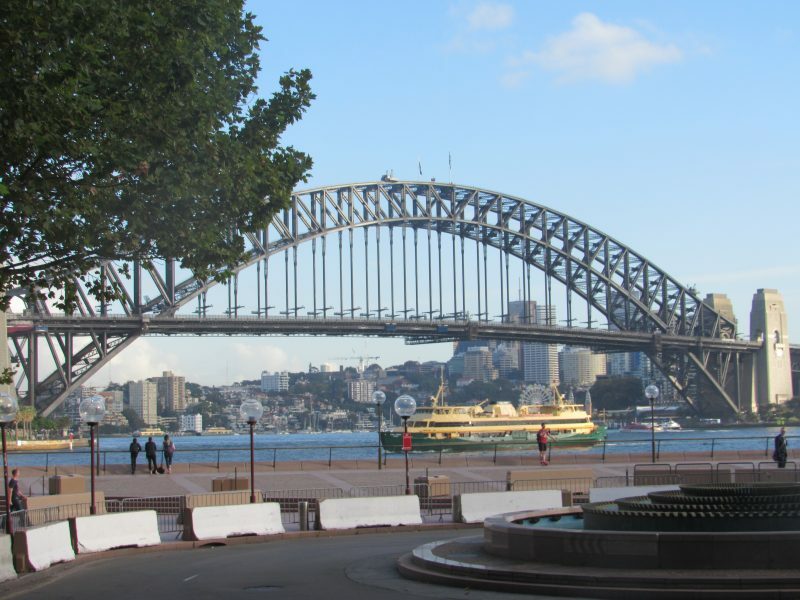 The Sydney Harbor Bridge, which you can climb for $300. Editor’s note: Henry Bender, of Ocean City, is a retired Ocean City High School English teacher turned full-time writer and global traveler. His seashore-themed book, “Stirring the Dust,” is a compilation of his articles and columns that appeared in newspapers and other publications. Accompanied by his wife, Karen, he is writing a first-hand account of his around-the-world cruise aboard the Queen Victoria for MediaWize/OCNJDaily.com. This is the fourth of five articles.